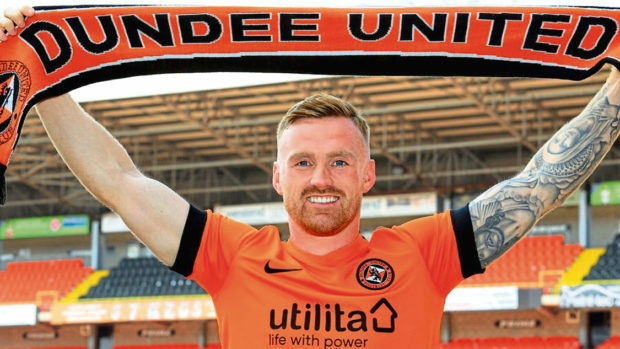 Former Ross County striker Craig Curran has set his sights on a quick return to the Premiership after joining Dundee United on a three-year deal. After leaving the relegated Staggies, Englishman Curran has opted to turn down top-flight interest to join Championship rivals United on a contract until 2021, with the 28-year-old joined by Dunfermline winger Fraser Aird in signing for the Tannadice club yesterday. The move ends Curran’s three-and-a-half year spell with the Dingwall side having been signed by Jim McIntyre from Nuneaton Town in January 2015. Despite having the opportunity to remain in the Premiership, Curran was excited by the challenge of helping Csaba Laszlo’s men fulfil their potential by returning to the top-tier for the first time since 2016. Curran said: “As soon as they contacted me it was something I was deeply interested in. “I had a few offers to stay within the Premiership which I mulled over and I realised this was where I wanted to be. “This is the biggest club within this league and one of the biggest clubs in the Premiership. I was up for the task. I’ve got a strong mentality which I think we are going to need to go up. “Promotion is the main aim of this season. It’s too big a club not to be in the Premiership. “It’s a massive club in the Premiership so it shows the job we’ve got to do and we’ve got to make sure we take care of it. “I don’t think you need to say too much about the size of the club – its history and its fanbase speaks for itself. Curran made 118 appearances for the Staggies, netting 29 goals, but insists there will be no room for sentiment when he comes up against his former club in the Championship this season. He added: “It’s just part and parcel of the game. Once the whistle goes and you’re playing, all the sentimental stuff goes out the window. “It won’t bother me too much, coming up against old friends. I’m sure we will be trying to kick each other off the pitch when we’re playing.